As a new Cal graduate student in the department of chemistry, I’ve heard many complain about the frustrating challenge of trying to find housing. Currently, the university only has housing available for 22 percent of its undergraduates and 9 percent of its graduate students, and most people agree that this is unacceptable. Proposals are currently underway to provide 7,500 more beds for students. However, I believe that the university can do more. 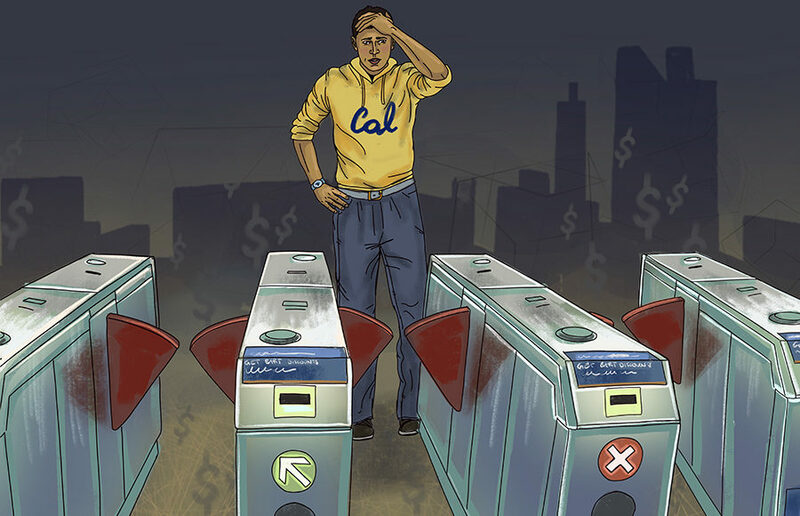 The university should also substantially subsidize the costs of public transportation and incentivize students to find lower-cost housing outside of Berkeley and commute to campus. Make no mistake — the cost of living in Berkeley is atrocious. But some of the areas surrounding Berkeley, such as Walnut Creek or Hayward, have lower property costs, and the cost of renting apartments there is much lower. Of course, they are farther away, but this issue is conveniently addressed by one of the best public transportation systems I have seen. For getting around the Bay Area, BART is one of the most convenient and fast methods available. Although BART riders can experience delays, the trains are generally on time, and riders don’t experience the stress or traffic of driving or taking the bus. The only real downside to this method of transportation is the cost. The cost of a ride from the Union City BART station to the Downtown Berkeley station on a paper ticket is currently $5. Considering that I come to campus six days a week, this brings the cost of my transportation to approximately $250 a month, which seems like a steep price to pay for using public transportation. But what’s that, I hear? UC Berkeley offers a discounted BART ticket? This seems like an ideal option, until you consider that the “discount” is selling you a paper ticket worth $48 for the reduced price of $43. This discount is approximately 10 percent. That seems like a small discount, but at least it’s something, right? Wrong. The fare to ride BART is reduced by 50 cents if you use a Clipper card instead of the paper ticket. Thus, paying $43 for the reduced-fare paper card gets me 9.6 rides, while using my clipper card for the same price gets me 9.56 rides. So I only save about 2 cents per ride using the reduced-fare paper ticket provided by UC Berkeley, and I have to walk two blocks from campus to the Parking and Transportation Office when I want to purchase tickets. I’m also one of the lucky ones. If you used the reduced-fare option traveling from Walnut Creek, you would actually lose about 7 cents a ride, as it costs $3.60 per ride using your Clipper card, and the effective cost per ride using the reduced-fare ticket is $3.67. This discrepancy with the reduced-fare option for students should be addressed so students get the promised discount, and the university should consider incentivizing students to commute by increasing the discount substantially or by making BART free to ride for students. The university and students could considerably benefit from building commuting housing near BART stations around the Bay Area, where property costs would likely be lower and more property might be available. Jason Calvin is a graduate student in the UC Berkeley Department of Chemistry.